High End Systems has partnered with Lightware USA to create an all-in-one lighting and video control platform for live events. Lightware USA is the US sales and support office for products from Hungary-based Lightware Visual Engineering. 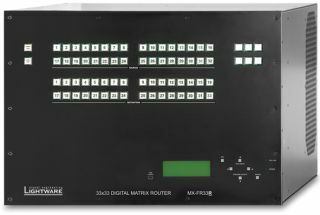 By connecting the High End Hog control family (including the Hog 4, Full Boar 4, Road Hog 4, HedgeHog 4 and RackHog 4) with a Lightware FR33 Matrix Switcher and developing protocol with Lightware EDID Manager, a single operator is now able to directly control lighting and video equipment. This means increased productivity and optimization and reduced time and costs spent on lighting and video control. "Working with High End on this project it feels like the foundation for building the future of professional lighting plus AV show control has been laid," said Drew Taylor, director of consultant and partner relations at Lightware USA. "That really excites me. I feel like there's room to grow here." "The Lightware router and Hog software solution allows production staff to use more gear with the same amount of personnel, making this a desirable control system for reducing costs and making the process smoother and much faster," said Jonathan Kemble at High End Systems. "This also allows them to add more equipment to their shows without adding complexity, which means they can offer more to their clients for the same price."